Come see us to get a quote on your truck lining and glass needs. 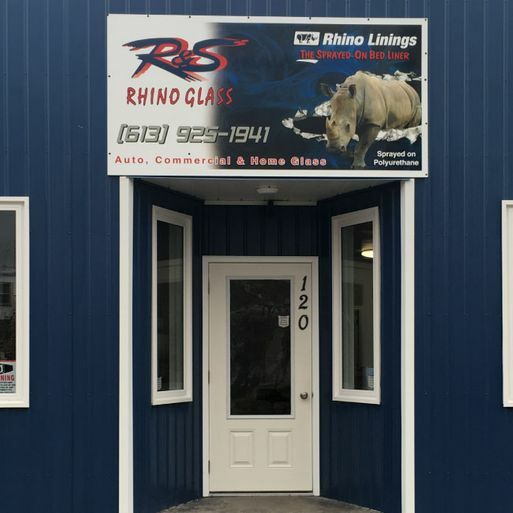 At R&S Rhino Glass, we are a one-stop solution for quality accessories and glass products for homes, commercial buildings, and vehicles. Serving Prescott and surrounding communities, such as Morrisburg, Brockville, and Kemptville, we offer a range of services to meet your automotive and residential glass needs. Starting in Prescott in 1992, we have been locally owned and operated since 2002. We seek to offer quality products and services at competitive prices. Our highly trained glass technicians are certified to handle auto installations and glass repairs around Prescott. We have assembled the best team of technicians in the area to ensure a perfect job every time. For our glass repair services, R&S Rhino Glass uses only the finest glass and adhesive systems available. Your windshield acts as an important part of your car crash management system. An improperly installed windshield using inferior products could put you and your family at great risk in case of an accident. As an official supplier of Gentek® windows, installation, and service is guaranteed. Available in vinyl and aluminum, our high-quality replacement windows and doors are available for your home. Replacing your windows and doors not only adds value to your home, they can help lower energy costs and reduce outside noise. We also provide high-quality commercial flat glass for office buildings and store-fronts. Let us give your car or truck a showroom quality shine. We offer complete detailing services for cars and trucks. Our automotive detailing services include scratch removal, paint touch-up, waxing, and more. Customize your ride with a variety of neon gauges and performance enhancing products. From window tinting to Rhino® Truck Liner, we offer an array of automotive accessories and services for your car or truck. We look forward to helping you with all of your automotive and residential glass needs. For more information about our products or to schedule an appointment, give us a call today. Our skilled technicians offer windshield repair & replacement. We offer quality residential replacement windows & doors. You can protect your truck bed with our Rhino® truck linings.